This was one of the first books I ever owned on cooperatives and worker-ownership. I bought it in hard-cover in the middle 90s, and it served then as a simple introduction to the practical and legal issues involved in founding a cooperative. There are surprisingly few books on the market today to help with the practical side of running a worker-owned business, so I thought I would reread We Own It and see how well this old guide has weathered the years. You can find used copies fairly easily on the internet, but is it still worth reading? I reread the revised 1991 edition, and even at that date, the book was old. The first edition came out in 1981, and many of the old black-and-white pictures that illustrate the pages appear as though they were taken sometime in the late 1970s. To be sure, much of the detailed legal advice will probably be well out of date by now, but in general, the authors do an admirable job of clearly and simply explaining the differences between various types of partnerships and corporations, models of cooperatives, and the myriad of tax issues involved in these different business structures. In the USA, the laws governing businesses vary significantly from state to state. Any group planning to start a new worker-cooperative would need to research local laws and possibly hire a lawyer before starting up in any event, so while some of the detailed advice in We Own It might be out of date or not apply in a particular area, all of the basic information presented on different types of business structures will still be valid and very useful today. We Own It covers all kinds of cooperatives: consumer coops, producer coops, housing coops, worker collectives, and employee stock-ownership plans. In the 1990s, I was mostly interested in the sections on consumer and housing cooperatives, but rereading it now, I am happy to see that a good portion of the book is devoted specifically to worker-owned businesses, and as the authors explain, many of the issues discussed in the book are shared by all kinds of cooperatives, so even the sections not directly relating to worker-owned businesses would still be of interest to socialist entrepreneurs. We once made an application for a bank loan and were turned down. We actually heard a rumor that we didn’t get it because we were an employee-owned business. They would never come out and say that to us, but they suggested that to us. The interviews are fascinating and I wish there was more interview material alongside the discussion of the legal nuts and bolts. We Own It is strong on the legal side of starting a cooperative, but I would have liked even more discussion of some of the many interpersonal challenges that can face a group founding and running a worker-owned business. I’d wager that more cooperatives fail because of problems with group dynamics than for any other reason, so in a practical guide, a thorough discussion of these challenges and of potential solutions would be particularly valuable. But leaving that one critique aside, I would definitely recommend We Own It as a comprehensive introduction. It shows its age, and you will still need to hire a lawyer, but the book is very useful. 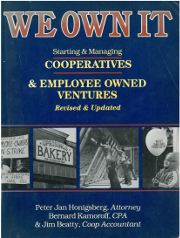 We Own It: Starting and Managing Cooperatives and Employee Owned Ventures, Revised and Updated. Jim Beatty, Peter Honitsberg, and Bernard Kamoroff, 1991, Bell Springs Publishing.